In the past, I have just played around with farming. My research farms and small acreages have provided opportunities to test concepts and trial products, but that does not amount to real farming. However, in this past year that has changed. My Nutrition Farms project has been the most fun and best challenge of my life to date. We are developing two very different farms, four hours apart, to demonstrate Nutrition Farming® principles. One of these properties is nestled amidst sloping scrub soils, with a mountainous bush-clad backdrop, just ten minutes from our head office and manufacturing base in Yandina (South East Queensland). This 100-acre farm is designed to demonstrate multi-dimensional, synergistic agriculture in the subtropics. I aim to have 50 different profitable, interrelated enterprises on this farm within 12 months. Currently there are just 18 enterprises, so there is a way to go. The other farm is as flat as a giant football field with soft, sandy soils and the coldest climate in Queensland. This Stanthorpe property is intended to demonstrate regenerative principles in a temperate zone. 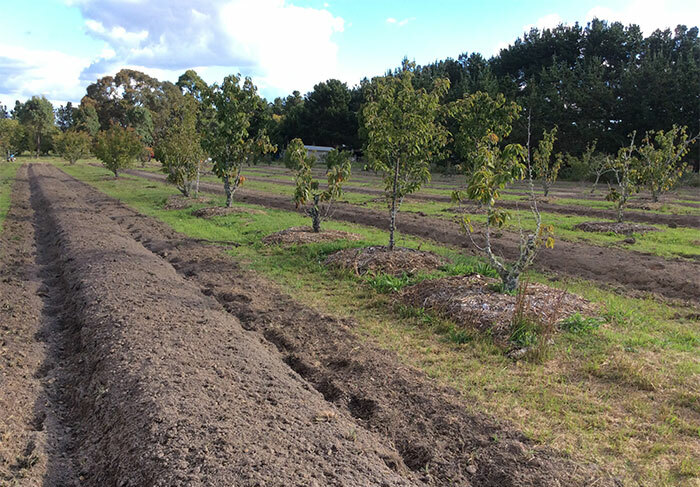 We have planted the first 4-acre paddock with over 1000 assorted stone fruit, apple and pear trees. Chillies, capsicums and tomatoes are planted between these trees in heavily mulched rows to take advantage of every dripper. The tall, 500-metre, chain wire kangaroo fence that surrounds this paddock will soon support vine crops like passionfruit, kiwifruit and chokos. Between the tree rows we have a dozen 1.2 x 150 metre raised beds. These strips are also fully mulched and fitted with three T-Tapes per row. 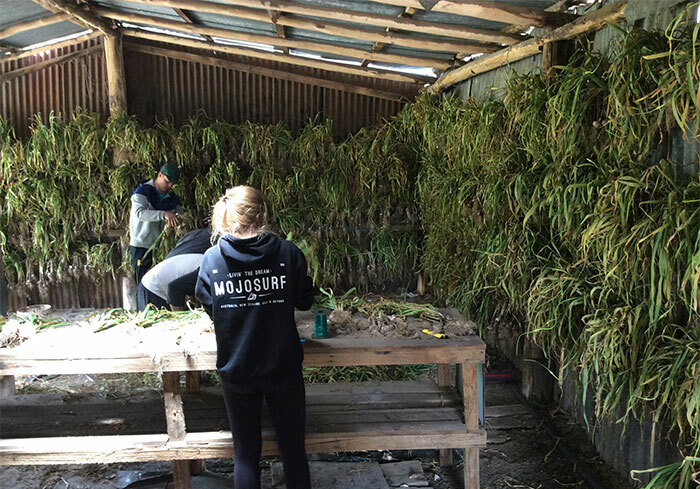 We have just harvested a bumper garlic crop from these beds and it is currently hanging to dry in the large, 80-year-old packing shed on the property. The raised beds have since been enriched with compost and a mineral fertiliser (Life Force® Gold™). 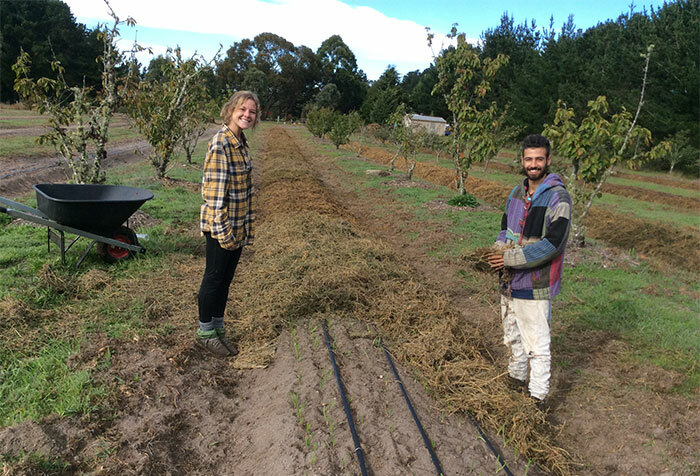 They have then been re-mulched prior to immediately replanting with turmeric, onions, chillies, capsicums and red cabbages. Another garlic crop will follow these vegetables after a similar soil regeneration strategy. The constant cropping should prove sustainable because we are feeding the soil, via fertigation, with humates, kelp, fish, amino acids and trace minerals on a weekly basis. Nutrient-dense produce from both farms is marketed under the “Nutrition Farms” logo and we currently offer well over 30 forms of fresh produce on a list emailed to subscribers each week. First, the garlic is soaked in bleach to produce an unnatural, pristine look. The intent is to suggest purity, but bleach is a dioxin. Dioxins are fat soluble, class one carcinogens and they should not even be in your laundry, let alone on your food. Then, the unfortunate functional food is dowsed with maleic acid to prevent premature sprouting. In continuation of the cancer theme, this additive is a proven class 3 carcinogen and can also create serious kidney damage. The third indignity bestowed upon this medicinal bulb involves irradiation to extend shelf-life. The major powerhouse medicinal component of garlic is called allicin. It can lower blood pressure, while reducing inflammation and boosting immunity. The enzyme alliinase converts alliin to allicin. Ideally, cloves should be bruised a little and then left to stand for 11 minutes to allow the formation of allicin before consumption. It is important to understand that irradiation neutralises all enzymes. This effectively means that there is no chance for allicin to form. It might look like garlic and you can still smell the sulfur component, but it is no longer the protective, defense food it was designed to be. Finally, the highly compromised cloves arrive on Australian shores and are subjected to a particularly nasty local ritual. Imported fresh food is soaked in methyl bromide to ensure that we are not importing any unwanted intruders into our country. This chemical was widely used as a soil treatment to kill nematodes and destroy weed seeds. It has been banned in most counties due to the extreme toxicity and damage to the ozone layer. All other counties that employ this toxic intervention insist upon a withholding period before the treated food hits the consumer. Australia and New Zealand are the only two countries that have not agreed to this withholding period. Perhaps you now understand why you might pay an extra premium for organic or biological garlic, produced in our country, rather than this imported abomination. Garlic has a long shelf-life, which is a huge advantage, because there is less urgency to sell your crop and you can often hold out for better prices. If that crop is favoured by foodies seeking intense flavours and chemical-free condiments, then you have a ready-made market for a superior, nutrient-dense product. It is also always preferable to choose a crop with inherent pest resilience that is not easily hail damaged. Finally, a crop that can be harvested in one hit is always preferable to labour intensive sequential harvesting. Garlic ticks all boxes. It is planted prior to winter and grows throughout that most unforgiving season. If dried correctly, you have well over six months in which to market your produce. Garlic is a popular inclusion in Australian multicultural cuisine and quality and flavour are really appreciated by discerning consumers. The climate extremes that have become part of our brave new world (including hailstorms) do not tend to be detrimental to this hardy crop and, if you keep the nutrition up, the pest pressure can be minimised. Finally, when this seven-month crop is grown in temperate zones, it fits perfectly into a time slot that allows for summer vegetables to be grown in the same raised beds for the following five months. 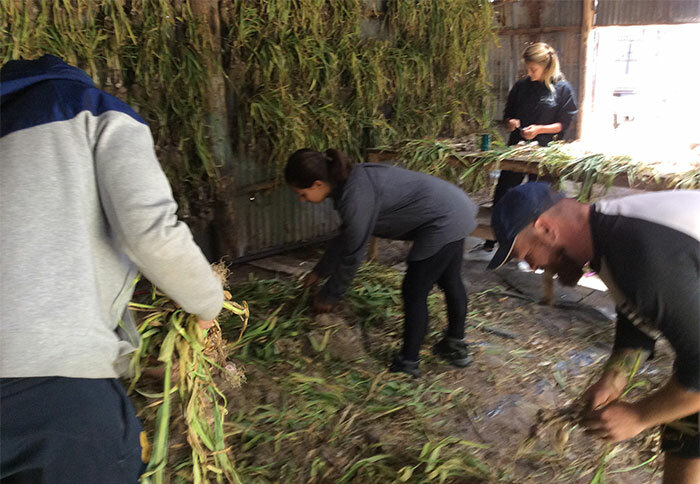 We have just harvested around 3 tonnes of beautiful, chemical-free garlic from an investment in 250 kg of seed. Here is how it was done, and I will also share some lessons learned that we believe will generate an even better crop next year. We began with several passes of a single tyne ripper over the grassed area between the fruit tree rows, which was destined to become our raised beds. We then used an Italian walk-behind tractor to cultivate the beds. These machines have an attachment where soil from both sides of the cultivated area can be thrown up to form a bed about 15 cm deep. Prior to this bed formation, we applied a complete mineral fertiliser designed by NTS, called Life Force® Gold™. This features several calcium sources, humates, paramagnetic materials, magnesium, natural phosphorus, potassium, nitrogen and the full spectrum of trace minerals. This complete nutrition is wrapped within a high-carbon, stable humus base. Elemental sulfur, in granular form, was included with this natural fertiliser because garlic is a strongly, sulfur-driven crop and the virgin soil was sulfur-deficient. NTS Soluble Humate Granules™ were also included in the mix to stimulate soil life and magnify mineral uptake. Finally, we also included some highly paramagnetic crusher dust in the blend, as the soil test revealed low levels of paramagnetism. Next, we had the tedious and strenuous task of forking through the new beds to remove the grass roots to reduce subsequent weed pressure. I stumbled into bed each night thinking my aching body could not possibly survive another day but each morning I was thankfully regenerated and ready for the next assault. The next step involved preparing the seed. After breaking up the bulbs, we soaked them in a solution of Seed-Start™ combined with Nutri-Life Platform®, our popular blend of mycorrhizal fungi (with added Trichoderma spp and Bacillus spp bacteria). We planted six cloves across the 1.2 metre beds and spaced them 10 cm apart. It was a dense planting, but I figured we could get away with it if the plants were supported with regular fertigation. Next, we laid three lines of T-Tape along each row to ensure adequate hydration of all cloves. 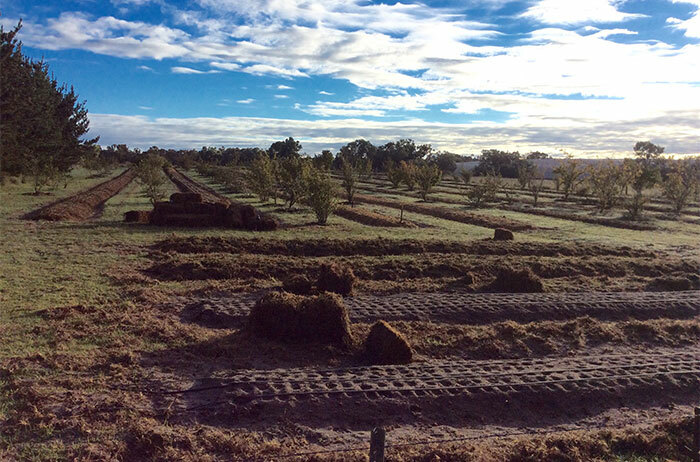 Finally, we mulched all rows with two truckloads of lucerne hay. These bales had been rain damaged after a cyclone had dislodged the shed roof, so I was able to buy them at a good price. However, it was not a good plan. The bales had become glued together and it was labour intensive, dusty and costly to spread them on the rows. Avoid digesters on mulch – we sprayed Nutri-Life BAM™ (Beneficial Anaerobic Microbes) on three of the 150-metre rows to monitor the response. The garlic certainly loved the bio-stimulation, but the lucerne mulch was rapidly consumed and, as a result, these beds required much more weeding during the season. 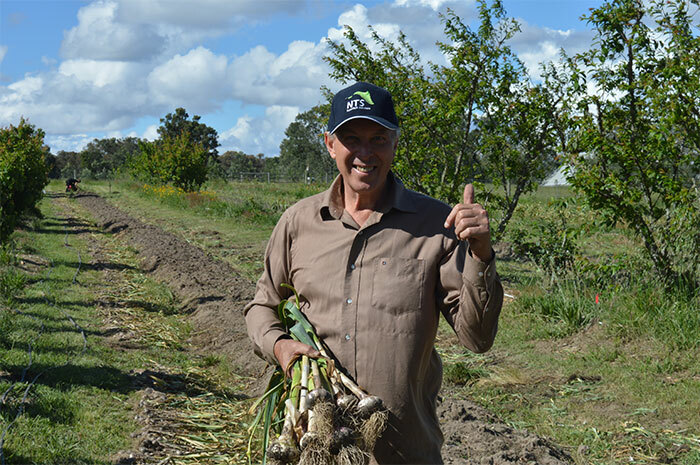 Choosing the right mulch – lucerne is a wonderful, soil-improving, fertilising mulch, but it is not a good choice for a longer term crop like garlic. It thinned on all beds during the six-month crop cycle and extra weeding was required later in the season. Sugar cane mulch is a more cost effective option with greater longevity. 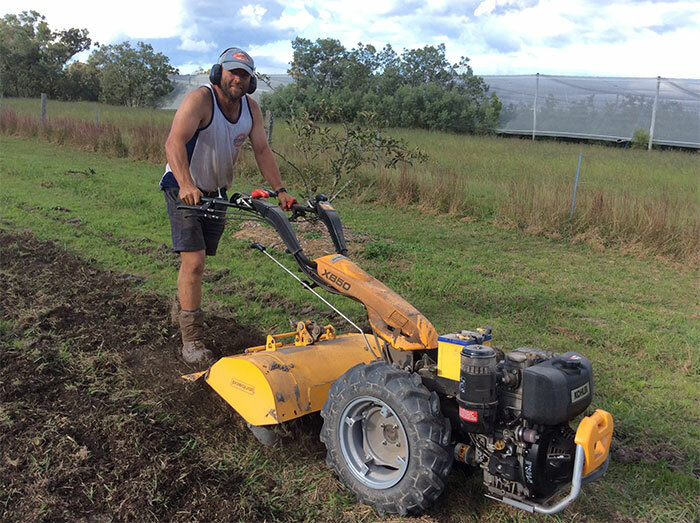 Avoid the ‘moron’ approach – during the bed preparation, I abandoned my precise reckonings for fertiliser applications and became a little heavy-handed. In fact, I succumbed to the ‘moron’ approach (if a little works well, then let’s put ‘more on’). The result was an overdose of molybdenum that induced a copper deficiency in the plant. This could have been a serious issue, as copper is used within the plant for primary protection against fungal disease. Thankfully, leaf analysis identified the problem early on and we applied a couple of foliar correctives of Nutri-Key Copper Shuttle™. Leaf analysis – at least twice during the season, this proved invaluable. We were able to maintain nutrition precision using this guideline, which is the key to pest resistance. 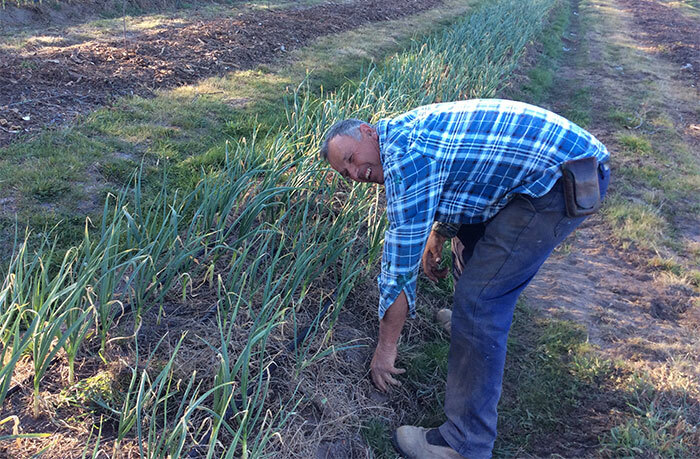 The garlic crop was completely problem-free, apart from a little frost damage in mid-Winter. Even then, we were able to foliar spray kelp, the great rescue remedy, to minimise stress. Size really matters – we decided to plant 10 metres of one row with smaller cloves to monitor yield difference. The harvested bulbs from this area were much less than half the size! I now understand that our yield could have been substantially increased had we chosen larger cloves for planting. We will certainly be sorting the best from the best for next season’s planting. Fertigation rules! – a simple 200 litre drum with a venturi, plumbed into the irrigation system, allowed an effortless supply of soil and plant nutrition throughout the season. My friend Adrian Minotto from Stanthorpe managed this crop in my absence, and he did an admirable job. The nutrition simply involved putting the nutrients into the fertigation tank and starting the pump. Feed the soil and plant – we alternated Triple Ten™ and Trio (CMB) Foliar™ to provide complete nutrition. NTS Liquid Humus™ was applied regularly to feed beneficial fungi and stabilise nutrition, thereby preventing leaching in these very light soils. Dia-Life Organic™ was fertigated several times to ensure silica-based cell strength for enhanced resilience. SeaChange KFF™ was also applied as a source of fish, kelp and fulvic to stimulate both root growth and beneficial soil life. Nutri-Life BAM™ was applied every 6 weeks via fertigation. 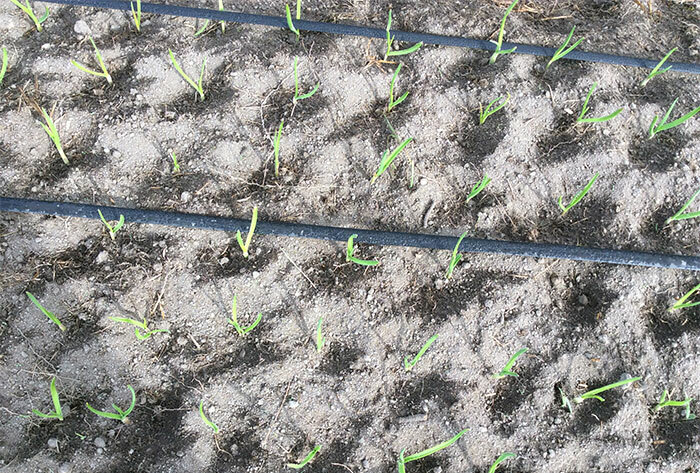 Finally, we applied K-Rich™ regularly during bulb-fill for this potassium hungry crop. Don’t forget the ‘mother's milk’ – there was an obvious benefit in kickstarting this crop by soaking the seed in a blend of mycorrhizal fungi (Nutri-Life Platform®) and key nutrients (Seed-Start™). In fact, this strategy delivered sprouting shoots within just 5 days (see photo). It proved to be a good strategy to leave the last flush of weeds until harvest so we could fully weed the beds for the next crop, as we harvested the garlic. There was no obvious negative yield impact from retaining these late season invaders. I will continue sharing in next week’s post, but next time my focus will be upon the second Nutrition Farms project located on the Sunshine Coast. Then, we will discuss our experiences on a multi-dimensional, subtropical farm. Please contact NTS on agronomy@nutri-tech.com.au or +61 7 5472 9900 if you are seeking product advice or agronomic assistance.